On the night of our third anniversary, Marcus and I made reservations at the ever-elusive speakeasy, The Columbia Room, near Mount Vernon Square in DC. I had stumbled upon many a recommendation (via The Foodist of Bon Appetit, various travel magazines, etc.) about this place, and I was immediately sold when I heard that The Columbia Room does a cocktail tasting menu on a really intimate level. A ten-seat backroom bar inside The Passenger (another awesome DC cocktail bar), The Columbia Room offers 6-7 staggered seatings per evening beginning at 5 PM, with last reservations at 11:30. As reservations can be made one month (to the calendar date) out, try to make reservations as early as possible as seats fill up quickly. Our reservations were at 9 PM because we wanted to squeeze in dinner at Birch & Barley beforehand (post to follow!). Brothers Derek and Tom Brown opened The Passenger back in 2009, which offers great cocktails and snacks. Soon after, they opened The Columbia Room, which "honors the original definition of the cocktail -- a combination of spirits, sugar, water, and bitters -- by crafting cocktails from the highest quality spirits with our own cordials, bitters, and tinctures along with hand-carved ice." 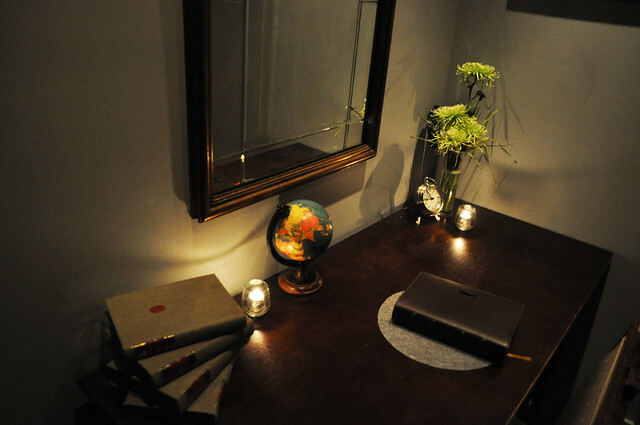 When we arrived to The Passenger, one of the barkeeps escorted us to the rear of the bar, where we were lead through an unmarked door and into a foyer that had an old-fashioned appointment book and an antique desk adorned with some cool knick-knacks. We were met with a gentleman donning a buttoned suit vest, later learning was part of the bartenders' uniform. Love that bit of authenticity! Inside The Columbia Room is a long counter bar with ten seats. Behind the counter was a crazy awesome collection of spirits, bitters, and bar tools to craft an endless menu of cocktails -- any mixologist's dream of a well-stocked cabinet. 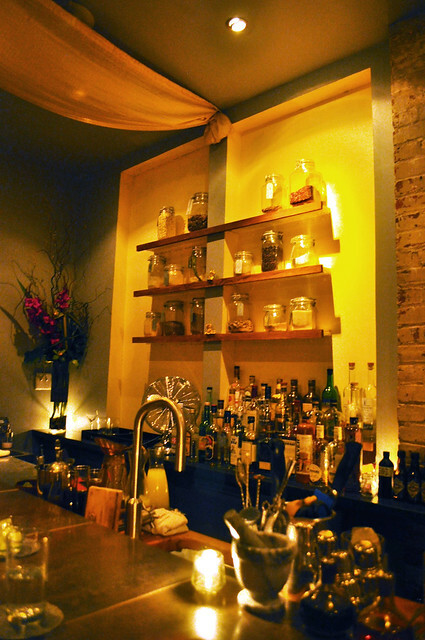 I love the shelves of jars filled with various dry ingredients -- gives the space an overall apothecary-feel to it. 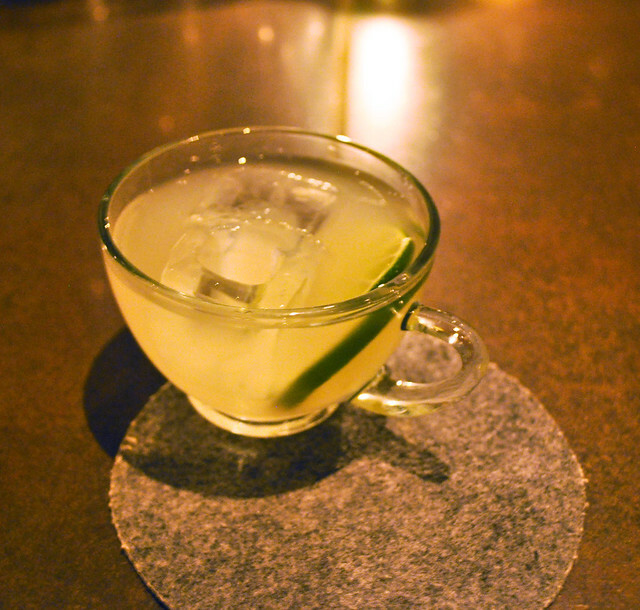 The first cocktail for the tasting was a Glasgow punch, a classic rum punch from Scotland. The Glasgow punch contained rum from Martinique, which is different from the Jamaican run typically encountered (e.g., Bacardi). Martinique rum is made using sugar cane, resulting in an earthier taste compared to its Jamaican counterpart which uses molasses. Along with the Martinique rum, the punch also had fresh lemon and lime along with cane sugar syrup for sweetness and a little water for dilution. This drink made for a great start to the cocktail tasting -- it was delightfully refreshing, having a nice balance of spirit and juice throughout. I loved the use of a glass tea cup as a little ode to the tea-loving country of the UK. 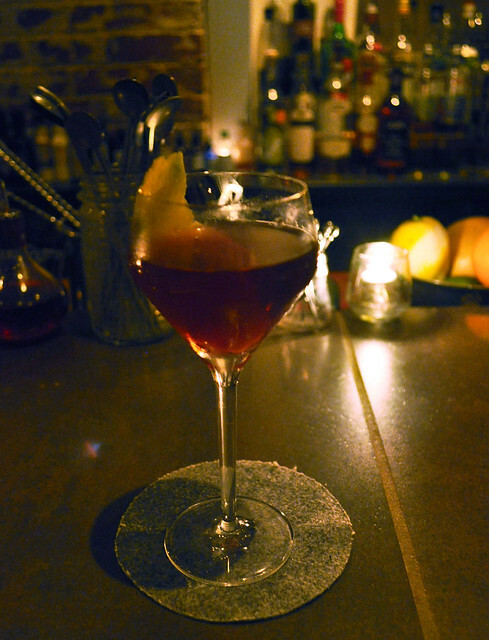 The next drink was Doctor's Orders, a twist on a classic Manhattan using High West whiskey, Cynar (an artichoke liqueur), some medicinal ingredients, vermouth, quinine (in the past, used for malaria), and New Orleans bitters (originally invented in an apothecary). Boy, was this drink really, really strong -- a complete 180 from the first drink! 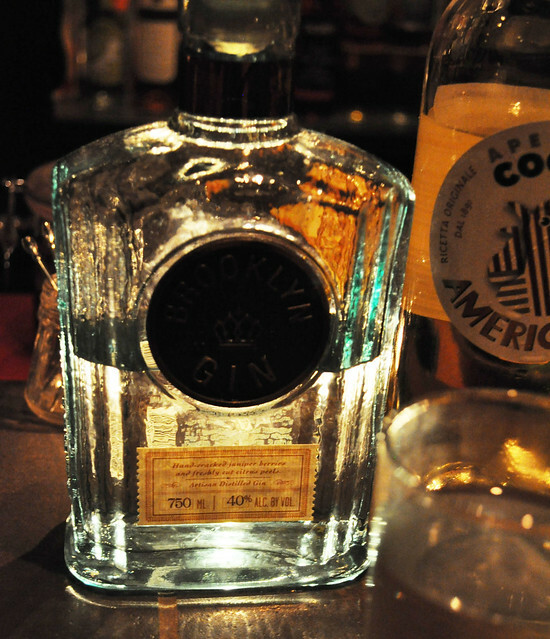 It was very much a spirit-driven drink, proving to be quite the strong sipping drink. 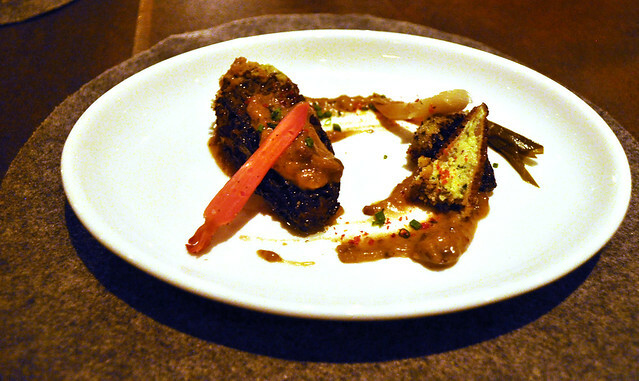 Doctor's Orders was paired with morel mushrooms stuffed with ricotta and arugula then drizzled with a mushroom cream sauce and served with pickled ramps and radish. I've never personally had a cocktail paired with food (only wine), and this combination of dish-and-drink worked unbelievably well. The creaminess of the sauce over the earthiness of the porous morels rounded out the biting characteristics of the cocktail, making it easier to drink and enjoy. Though initially it wouldn't have been my first pick of cocktail, it worked really well as a pairing. Before the third drink, we were served some green pitted olives and then given the option to order a supplemental dish of hand-sliced Serrano ham. Hell yes! 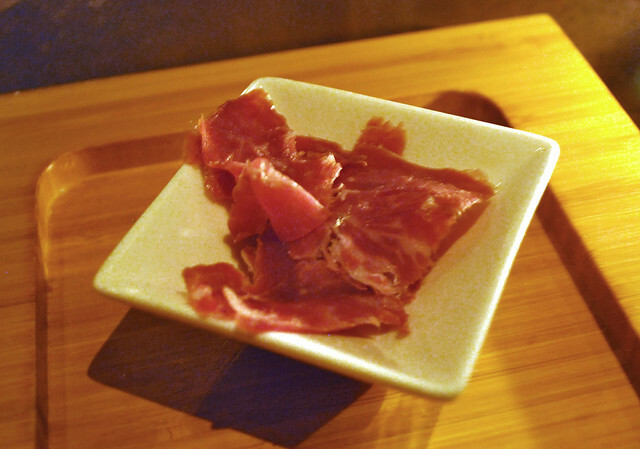 We savored the short ribbons of Serrano ham -- melty and savory with just the right about of fat throughout. The ideal bar snack for sure! For the last drink in the tasting, the bartender said it was up to us -- whether it be a personal choice of spirit or even a concept/idea. Whatever it may be, he would do his best to emulate it. Marcus made it a tad bit more challenging for the bartender, asking for a cocktail inspired by the "surface of the sun" -- the resulting concoction was the Sunburn, a creative take on a pisco sour. 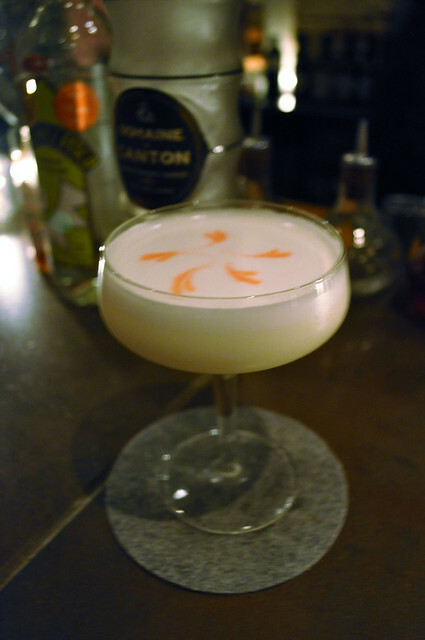 It was a combination of pisco, French ginger liqueur, egg white (for texture), lemon juice, and a few drops of tabasco (for heat) -- all of which was blowtorched for a few seconds. Marcus absolutely loved this drink -- hands down, his favorite of the evening -- if not for its beauty but for its seamless execution. It was citrus-y, which emulated the token color of the sun. The egg white gave the drink a generous frothiness to it, and the tabasco not only conveyed literal heat from its spiciness but possibly acted as an analogy for sunspots. Together, the egg white and tabasco created a sense of what a fiery storm would be like at the surface of the sun, only to be further emphasized with the briefly torched surface of the drink. Bravo! 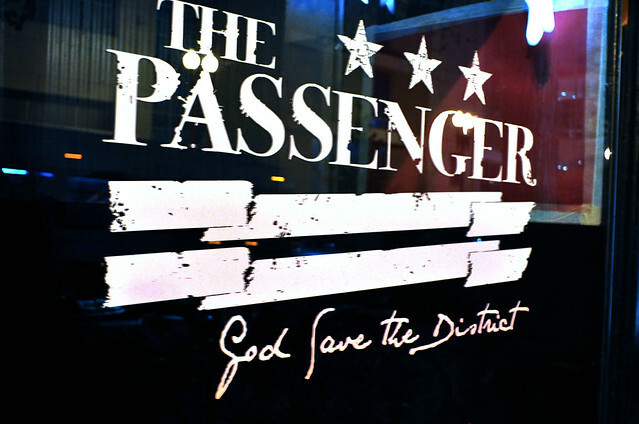 Findings: There are some crazy awesome things happening behind the unmarked door at The Passenger, that is, inside The Columbia Room. Do not mess with its barkeeps -- they seriously know their stuff, running the gamut from the detailed history of cocktails to the sheer improvisation driven by a patron's whim. Marcus and I were thoroughly impressed with the fastdiousness and dexterity in the cocktails crafted for the two-hour seated tastings at The Columbia Room -- it was unlike anything we had ever experienced in our adventures with the shaken and stirred. 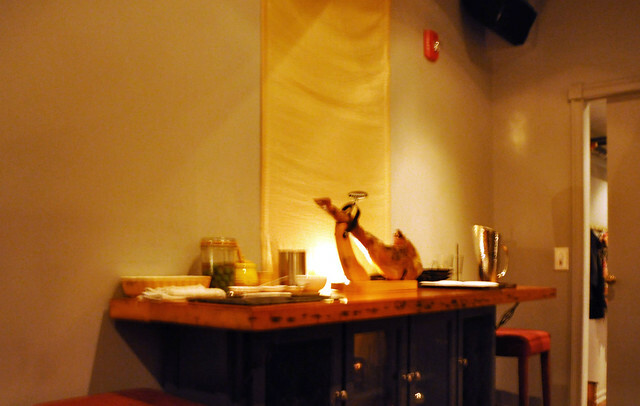 Price point: $69 per person (service and tax included), $12 for a la carte Serrano ham. 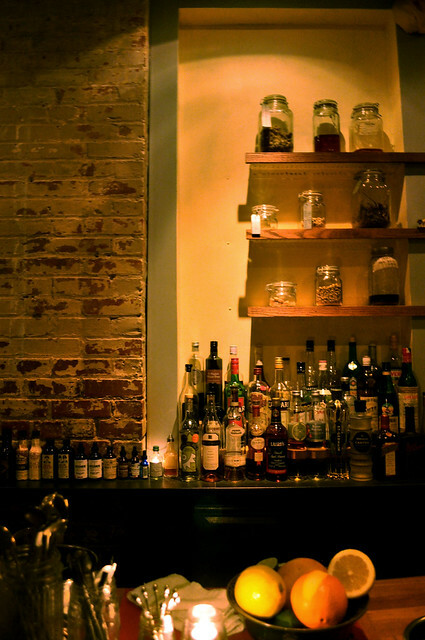 Tags: 2013, bars, dining reviews, drinks, first visit, speakeasies, The Columbia Room, The Passenger, three-course, Washington D.C.